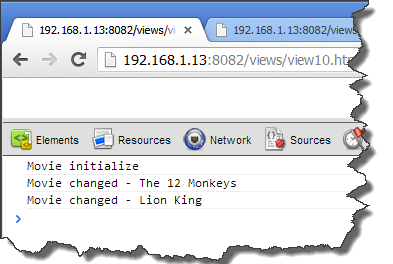 In this post we will learn about how a view can monitor changes or events in other views. A common scenario is to display a list of items. When the user clicks an item from the list, the details of the item is displayed in a different view on the same page. The user can then edit and save the details back to the list. In this example we will have a list of movies. 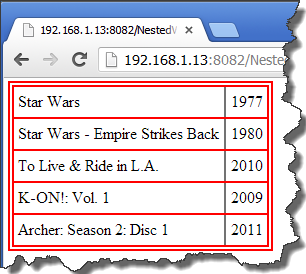 When the user selects a movie from the list, the data for the movie will be populated in text boxes, which is in a different view. Once the user changes the data and clicks “Change Record” button the changes will be updated back to the list. The fundamental concept to understand is that the child movie view is not aware of the detail movie view. Neither one of the views are aware of the other. This is important because it decouples the views; it allows us to remove or exchange views without modifying other views. In a previous post Re-Learning Backbone.js – Events (Pub-Sub) we learned about PubSub in isolation. In this post we will use PubSub to notify the triggering of events when a change occurs in a view. Previously in this series we have learned about views and collection. 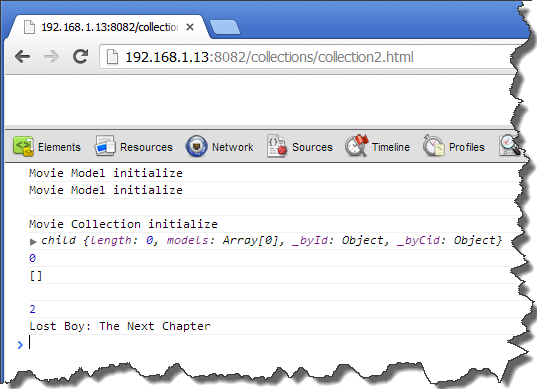 Now lets learn about creating nested views based on a collection. Most if not all of the concepts learned in the previous Re-Learning Backgone.js tutorials will be used in this blog post. As in previous posts, we will start-off very simple and take very small steps to get to our end goal. The reason to take all these steps is to make sure each addition to our solution works. This will be a 7 part post. For this post our end goal is to create a very simple list of movies. 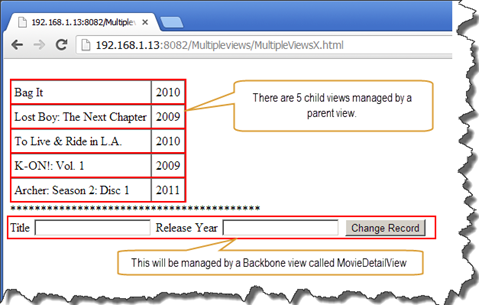 Each individual movie displayed will be managed by an individual Backbone view. There will be another view that creates and manages the child views. I have bigger plans than this, but first wanted to do something simple. Since we are here to learn about Backbone.js, we are going to use the built in feature of Backbone called Events. Backbone.js Events is a feature that provides a Pub-Sub. As usually I’m going to attempt to keep this a simple as possible. To provide a basic understanding of Pub-Sub, we will not work with views, models or collections; we will only work with Backbone Event. My goal is to keep this extremely simple, and the concepts that you learn here can assistance you when build more complex, maintainable, extensible, flexible, and plus other bilities websites. 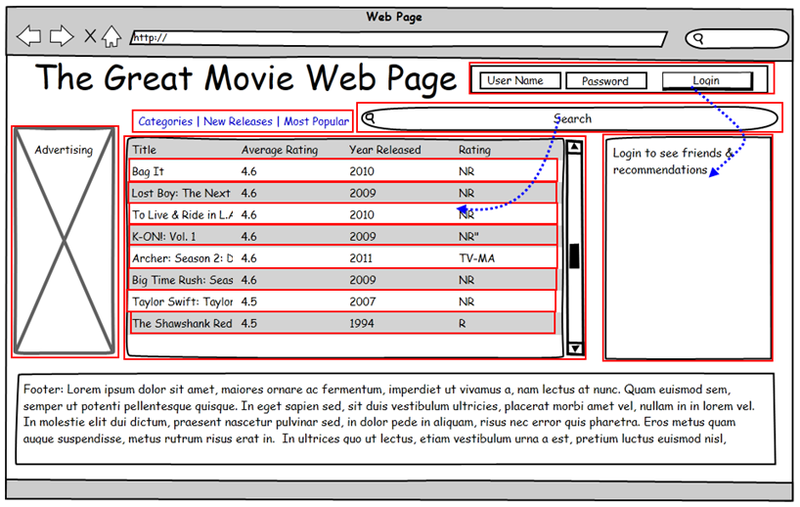 Below is an example of a protypical webpage. In a webpage like this, anytime the user does an action on the webpage, such as login, search, sort and other other action, the page refreshes. One reason we are learning Backbone.js is so that we can provide a better experience to the user by providing single page applications (SPA). 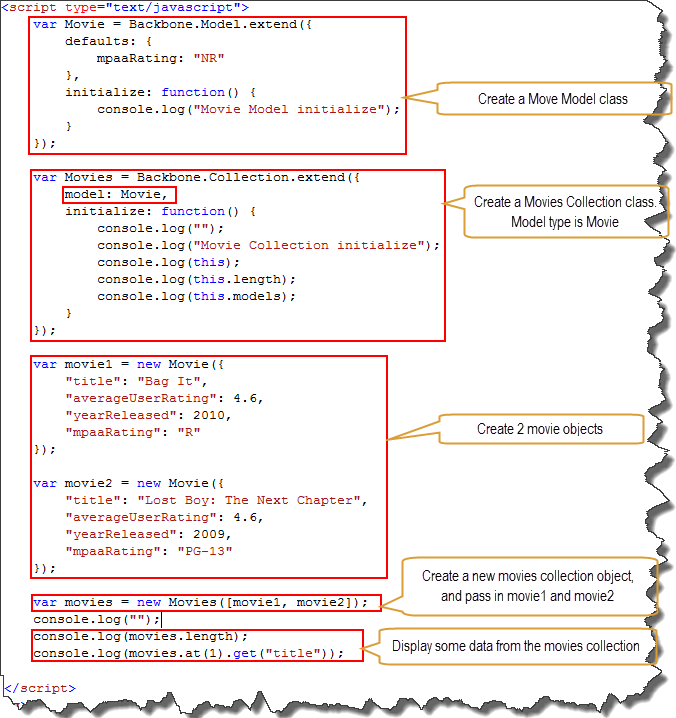 If we created an application like the following with Backbone.js, there could be many views (items in red boxes). 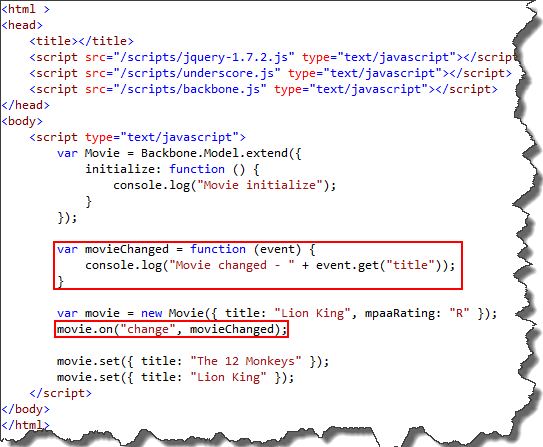 In a webpage like this, the developer my define in code that the Search view is aware of the Movie List view, or the Login view is aware of the Recommendation view. For example, if the user logs-in, the Login view will directly notify the Recommendation view of the login. This is fine for simple SPA. But if this is done on a complex website like Trello, which is created with Backbone.js, maintainability and extensibility and other bilities may become an issue. For example, what happens if management wants to replace the Recommendation view with a new Friends View. Now the developer must change the code in the Login view to update the Friends view. In this example the developer has tightly coupled the Login view to the Recommendation view. Probably not the best decision the developer has made. This is somewhat techno babble, but once you understand the Pub-Sub or Observer pattern, these definitions make a lot of sense. It doesn’t help out a lot here, but hopefully we get you to the point where these definitions do make sense. So forget about the example above. We are going to use a simpler example. Lets assume we have a security system. The security system is made-up of 3 key parts: a door (publisher), control panel (hub), and customer service (subscriber). Anytime the door (publisher) opens, the customer service (subscriber) will be notified. But we don’t want to tightly couple these objects together. We needed a mediator that manages the subscribers and the publishers, and this is where the control panel (hub) comes in. In 2011 and in early 2012, I did an extensive amount of work with Backbone.js. I believe I was fairly competent with the technology and grew very fond of Backbone.js. During this time I created a blog post on Backbone.js, “Understanding Backbone.js – Simple Example”. Based on comments, this post did help a few individuals. Sometime around March my priorities changed and since then I’ve done very little client side development. In November I started back doing client side development. I researched the different MV* frameworks and settled on using Backbone.js again. While I understood the concepts of MV* frameworks and Backbone.js, some of the details of the technology I could no longer recalled. Programming is definitely not riding a bike. Since I was doing this on my own time, I didn’t have any deadlines or anyone I reported to. So I decided to re-learn Backbone.js from scratch. When I wrote my first blog post on Backbone.js, I had many months of experience with the technology. I tried to create a very simple tutorial, but anyone who has no knowledge of Backbone.js would have a difficult time understanding some of the concepts. It’s amazing how well some authors can convey a concept at a beginner’s level about subjects that they are experts in. I know others that are extremely brilliant, but when they discuss a concept to someone who has little knowledge about the topic, they have a very difficult time explaining it. There are concepts that I know that I take for granted, and trying to explain these concepts at an elementary level is not easy. Many times when explaining something there are multiple concepts that need to be understood, and each concept needs to be understood to understand the other concepts. In the “Understanding Backbone.js – Simple Example” blog post, I took for granted that the readers understood certain concepts. The post I wrote was not short, and if I didn’t make these assumptions about the reader, the post would have been much longer. Up to this point I have now written 7 posts in regards to re-learning Backbone.js and hopefully there will be more to come. This has been a lot of fun. With writing these posts I have learned much more than I would have otherwise learned. I hope these posts help others to learn Backbone.js and be more proficient. It’s amazing the number of kind comments that readers provided to the post “Understanding Backbone.js – Simple Example”. Even though I’m not a sentimental person, these comments do provide me great appreciation that others benefited from the post. Please keep the comments coming. I am thankful for them and they keep me writing about topics I enjoy. Below are my posts on Backbone.js. I plan to keep this list up to date on topics about Backbone.js. 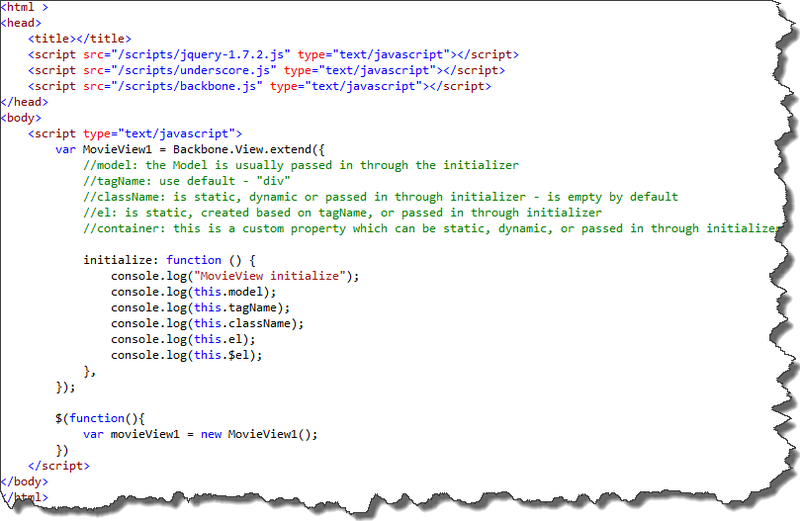 It is common for Backbone.js views to include elements that the user can interact with. For example, the user can enter text in a text box, hover over a div, or click a button. These types of interaction can trigger events. If a Backbone.js view is bound to these events, then the view can react to these events. Reaction to these events could be validating data, displaying a message box, or saving or updating data in the model. While we learning about Backbone.js view events, we will keep it very simple. In the following example we will not have templates or models, we will be working with a very simple view. In this example we will bind an input textbox key-up event to a view’s function. 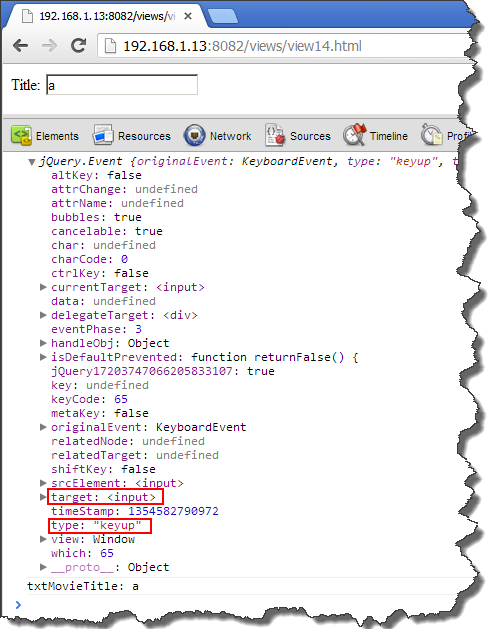 Whenever the user presses a key, an event should be triggered and a function should be called to log the value of the textbox to the browser console. In the previous post we learned about Model Binding in isolation. There are many places where model binding can provide benefit. Where we see model binding the most is in relation to using views. Usually we want the view to depict those changes in the model. In this post we will bind a model to a view. In the following example the view will be updated when the model changes. Usually a view tracks a model, and when the data in the model changes the view is updated to represent the changes. In the previous two blog posts we learned about Bakbone.js Views, but our views did not track models and were not update when the model changed. 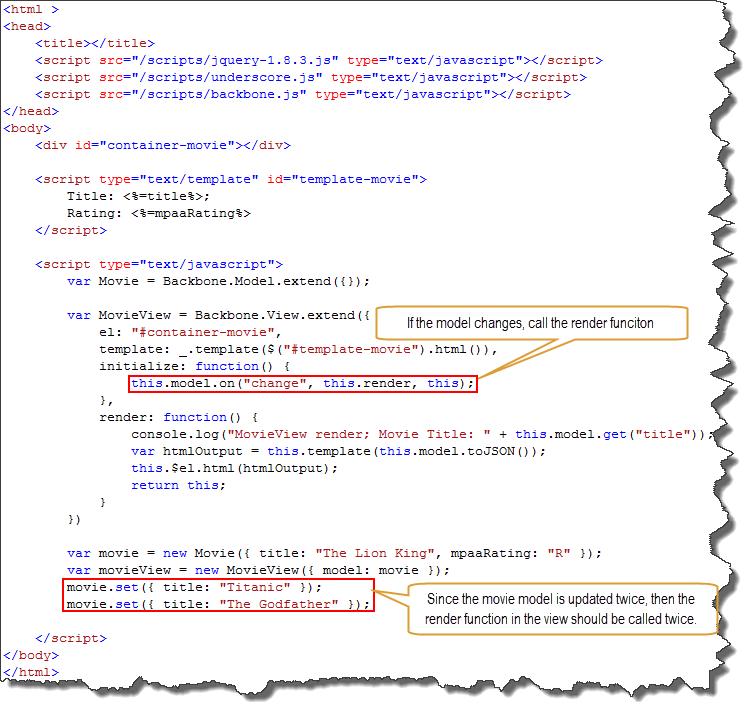 In this example whenever the model’s data changes, the function movieChanged will be called. 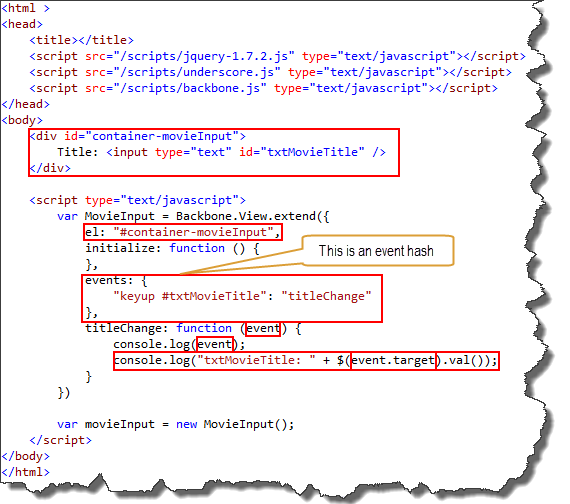 In this post we learn about different ways to render HTML using Backbone.js view and Underscore templates. A Backbone view should include a render function. The render function should have the responsibility of manipulating the view’s el property. The el property is then used to update the DOM. In this first example we are going to add some text to a DOM div element. There is probably more confusion with Backbone.js Views than with other features of Backbone. In this post I’m going to describe some basic features of Backbone Views. Also, In this post we will not be rendering any HTML, but I believe the concepts that you will learn will provide the bedrock for understanding Views better. 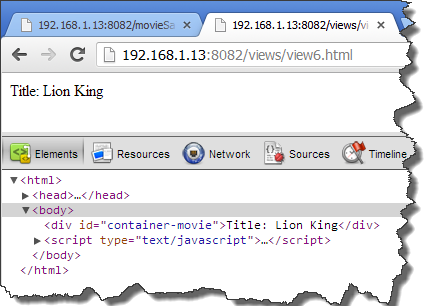 The end goal of a Backbone View is to represents an object in the DOM. Many times a view will be created that will manipulate an object that represents an element that is not originally assigned to the DOM. 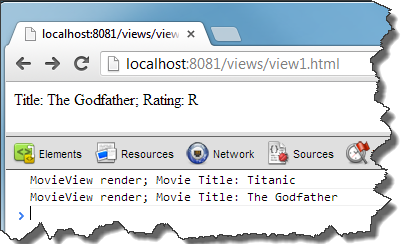 At some point the view object will be assigned to the DOM element and displayed. A view usually builds up an element and adds it to the DOM. Here’s an example of what a view represents. This element would be built by the Backbone view and then added to the DOM. It’s important to understand that once a view is added to the DOM, the view is still aware of that element in the DOM and can manage that element. So if events occur on the DOM element, such as click or keyUp, the view can be notified of these changes and take action. Also if a view references a model and the model changes, the view can be automatically updated and in-turn the DOM element will be updated to reflect the changes in the model. 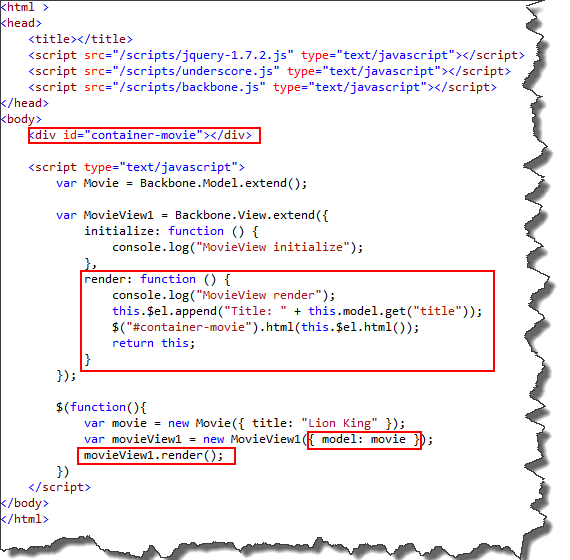 “How does Backbone relate to “traditional” MVC? I don’t want to overwhelm you with a lot of content, so I’m going to take very small step to explain some core features of Backbone views. Even though it’s our end goal, in these examples we will not assign a view to a DOM element. Everything will be logged to the browser console. //tagName: use default - "div"